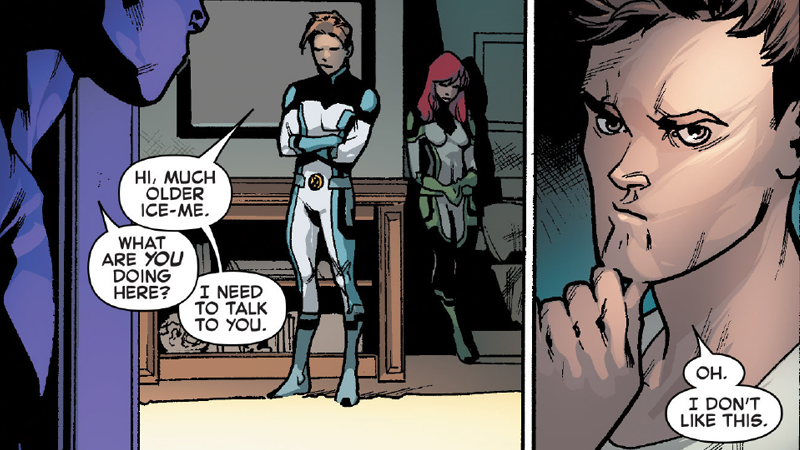 When All-New X-Men #40 released, a major topic of discussion was the fact that a younger, time-displaced Bobby Drake, a.k.a. Iceman, came out as gay. But ever since, fans have wondered if this meant the present-day Bobby was simply in the closet, or maybe not gay at all. Seven months later, we finally have the answer. Spoilers ahead for Uncanny X-Men #600, by Brian Michael Bendis, Sara Pichelli, Mahmud Asrar, Stuart Immonen, Kris Anka, Chris Bachalo, David Marquez, and Frazer Irving. It’s an interesting mix, as we flashback to Colossus meeting up with Kitty Pryde after she’s spent months in space with the Guardians of the Galaxy (and finds herself engaged to Peter Quill), Past-Bobby dealing with Present-Bobby, the original time-lost young X-Men deciding to go their own seperate ways now that they’re stuck in the present, and ultimately to a confrontation with Scott Summers (on Capitol Hill of all places) after he’s disavowed the X-Men and gone on the run, seeking a Mutant revolution. This completely clashes with the betrayal and persecution Beast feels as the other mutants confront him, as he rails that he’s being put “on trial” for his actions. While Beast feels under attack, untrusted and alone (setting the precedence for him leaving the X-Men and joining the Inhumans in Uncanny Inhumans), the theme of all these little moments in Uncanny is a sense of resolution—of people coming together and reaching a better understanding of each other. Colossus reconciles with his sister, Magik. The young X-Men come to understand that they need time apart from each other. The confrontation with Scott doesn’t end in bloodshed but a brighter outlook for all Mutants. And, most pertinently, it sees the two Icemen come to understand each other more. Consider it’s been something that’s simmered in the background for Iceman since All-New X-Men #40, it’s done pretty bluntly, as Past-Bobby confronts Present-Bobby—and there’s even a little jab in Jean Grey’s direction, for the way she psychically outed the young X-Man in an incredibly not cool manner. But Present-Bobby’s reaction is earnest, and extremely well handled. It is, as many expected, that Bobby is indeed gay—and that years hiding his sexuality, and dating women, were to avoid a life of persecution for being a Mutant and a gay man at the same time. And while it’s a retcon of the character’s past for the sake of diversity, the moment it’s handled in is pitch perfect for Bobby. It’s a conversation that’s probably more than familiar to people on the LGBTQ spectrum even if it’s not something they’ve personally experienced, the desire to want to hide away your sexuality and not let it define you. While I wasn’t the biggest fan of the way Bobby was outed in All-New X-Men, this is at least a resolution that is much better handled. God, Jean, again with the mind-reading personal information without asking first! One of the things that Jean mentions elsewhere in this issue is that she wants to learn and get better control of her powers with the new X-Men. I hope for the love of god she learns how to not violate people’s privacy with them at some point, too. The question young Bobby asks? It’s if the older Bobby still thinks Angel is hot. Because whether he’s gay or a mutant, one thing Iceman has always been good at is diffusing a situation with some dorky humor. But even though it was perhaps more than a little obvious that this would the case following All-New X-Men’s reveal, it’s nice to get it confirmed.